This book is a collection of contributions from a conference entitled 'Can creativity be measured', which took place in Brussels 28-29 May last year. The conference was organized by DG Education and Culture (DG EAC) together with the Centre for Research on Lifelong Learning (CRELL) of the DG Joint Research Centre (DG JRC). 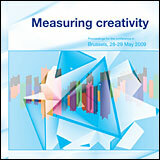 The book provides an overview of two main approaches to the measurement of creativity, including aggregate level approaches, where different existing statistical indicators can be used as pointers of creativity in a region or a nation, and secondly, the measurement of creativity at the individual level. Senior MERIT researcher Hugo Hollanders is contributing with chapters 3 and 4, one of which was written jointly with MERIT scholar Adriana van Cruysen.